One of the common denominators I’ve noticed in every book I have read is that Aspies like routine. Like isn’t a strong enough word… they need, crave, can’t function without routine. This is certainly true for our Aspie. Every now and then we can get away with verbal schedules when there is not a lot going on. For example, in the morning at breakfast I will tell him, “After school you are going to the YMCA, I will pick you up around 5:30 and we’re coming straight home.” When we get home he knows that he gets 5-15 minutes of “free choice time” before he has to start his homework and finish his chores. He then gets free choice time until dinner is ready. After dinner he has to take a shower and get ready for bed. If any one of those things gets mixed up without warning he can become angry, irritated, or start a full-blown meltdown (wailing and gnashing of teeth, etc.). Aspies are not usually great organizers of their time. They get distracted or they get involved in a project, and when their time is up they have a hard time transitioning to another task. Can you see where this would be a problem, say, in a classroom? We have some stress-relieving techniques that have worked wonders for Cullen’s stress level, and by extension ours as well. Cullen likes to be independent. He enjoys doing things for himself, especially doing what he is supposed to be without mom and dad telling him. In the mornings before school he would fight getting ready, he would fight me when I tried to wake him up even. He kept saying, “I know what to do mom. I’m a big kid. I don’t need you to tell me!” But we were constantly struggling to get ready in time for school. Then he asked me for an alarm clock. 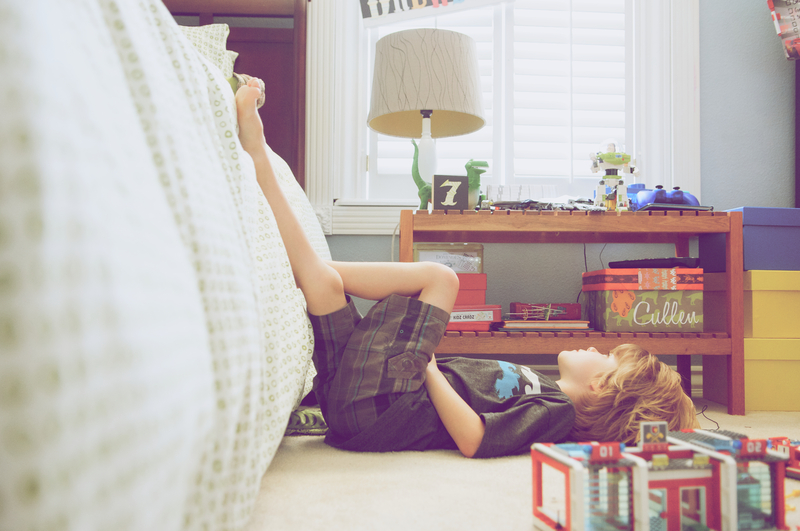 He said he would be able to get up and get ready easier if the clock woke him up and he could see the time. We went down, and bought a Lego alarm clock with a radio. This helped a great deal with him not getting angry at me for waking him up, but he would get distracted with toys and not actually be getting ready for school. One day at Target, while treasure hunting in the dollar section, I came across Cars themed dry erase boards! I had an epiphany! They were affordable, easy to hang anywhere, AND they had his favorite movie characters on them. I bought 3, and that night he and I made a morning checklist. Once he completed everything on the list he was allowed free time until we had to leave for school. Mornings became a breeze! To the point that now, he no longer needs the checklist. I also hung one on the refrigerator that I would use for the daily schedule: school, YMCA, grocery store, errands etc. During the week our schedule is pretty static, but this board became a lifesaver on the weekends when we always have something different going on. He would check the board, memorize it and then keep the rest of the family on schedule the rest of the day. 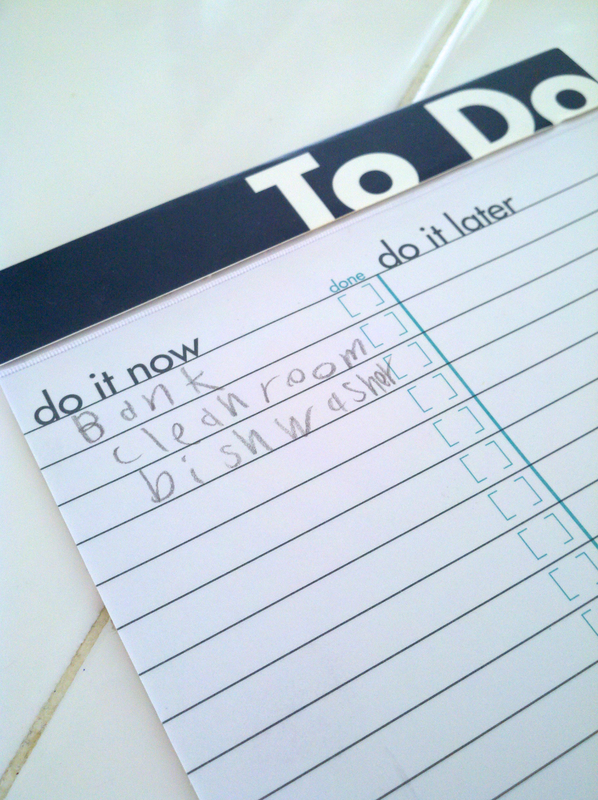 The third one I saved for his chore list. He loves being able to check off the items as he goes along. He also really likes to make his own lists. I found this To Do notepad in the dollar section too, and for a week he was making up lists. He carried it around all day, asking what we were going to do that day and what chores needed to be done. These kind of lists work great for one time events or special schedules. Last year we drove from southern California to Phoenix to visit family with all 3 boys. Before we got in the car I wrote a list of “Car Rules” for Cullen and every time we got back in the car we would have him read them. He does so much better remembering what to do when he can see it and read it. When I first heard about Carol Gray’s Social Stories I wondered a) Where was I going to find the time? b) Would it work? c) Where was I going to find the imagination and creative juice for it? But mostly where was I going to find the time? We have books that teach lessons, but they’ve never made much of an impact for Cullen. Social Stories work because they are personal and usually incorporate the subject’s obsession somehow. At the time I was researching one of the major struggles we were having was with Cullen’s showering methods. He would either not be in there long enough to clean himself, be in there for way too long, or he would start playing with the soap/shampoo and dump it down the drain. Daily showers were getting costly. Dad and I would have to yell up the stairs to remind him of the next step, or sit in the bathroom to keep him on track. I was trying to think of a social story using his obsession… Legos. Then I thought… we are photographers! I can make him Instructions for a shower using his Legos and take pictures of each step. So I built a bathroom that looks like his, (look there’s even a little toilet!) assembled a Lego Cullen and set up a mini studio to take the pictures. I used whipped cream for the soap and shampoo shots. I dropped the photos into Photoshop and created specific directions for him. We laminated it and taped it in the shower. Since then we hardly ever have to remind him what to do next or hurry him up to get out. Granted, we still do a smell check to make sure he’s actually washed his hair… but for the most part he is an Independent Shower Taker now. Our guests might think we’re crazy, but who doesn’t love a little Lego comic while they are showering? Cullen loved this so much he asked me to make more for him. I haven’t had any other tasks that need this kind of instruction though. We have so many Legos that I think I could make instructions for almost anything. So if anyone wants a custom one for themselves contact me and I can see what I can do. Maybe I should start an Etsy shop for it! In hindsight I should have included a few other details, like hanging up your towel and not running through the house naked. I once told him that he shouldn’t be taking more than 5 minutes in the shower. That night I heard him counting and asked what he was doing. He told me he was counting to 60 five times, because he didn’t have a clock in the bathroom and wouldn’t know when five minutes was up. He was so busy counting that he forgot to wash his hair, which made a funny yet necessary conversation about what I meant about approximate time. One of our dear friends, Bethany Barton, created a How To Brush Your Teeth comic with a dinosaur (another one of his favorite things) for us to put on the bathroom mirror. How awesome is this dinosaur? And his teeth are so white and clean! I love all the little details she included. She knows exactly how his mind works and she thought of everything.. like turning the water off and rinsing the brush?!?! Get out of here with your thoroughness Bethany! One of our main goals for Cullen is for him to be independent. 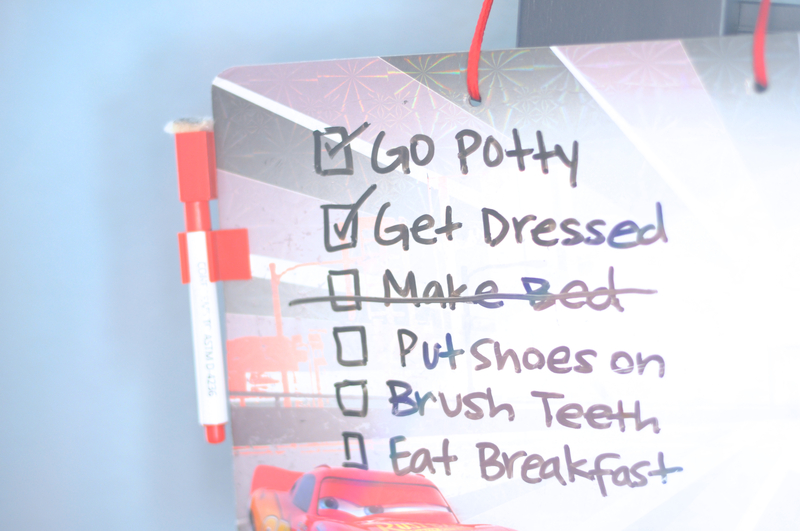 Even if it means making a list every morning of what he has to get done. Building that confidence so he can take care of himself and giving him the responsibility now, even at a young age is crucial. So the moral of the story is that it takes trial and error, and lots of tools. Try some of these out and let me know the results! I’d love to hear what works for you.